BMT D-Type Triplex 6052 on the Brighton Line at Beverley Road, January 1961. George Conrad Collection. The C-types were rebuilt open platform elevated cars, rebuilt by the BMT in 1923-1925. Each C-type unit contained 3 cars semi-permanently coupled, with a motor car on each end and a trailer in the middle. The gates and platforms at the ends of the cars were removed, and two doorways were cut into each side of each car. Outside-hung sliding doors were attached to the cars, common in Boston at the time and London at present. 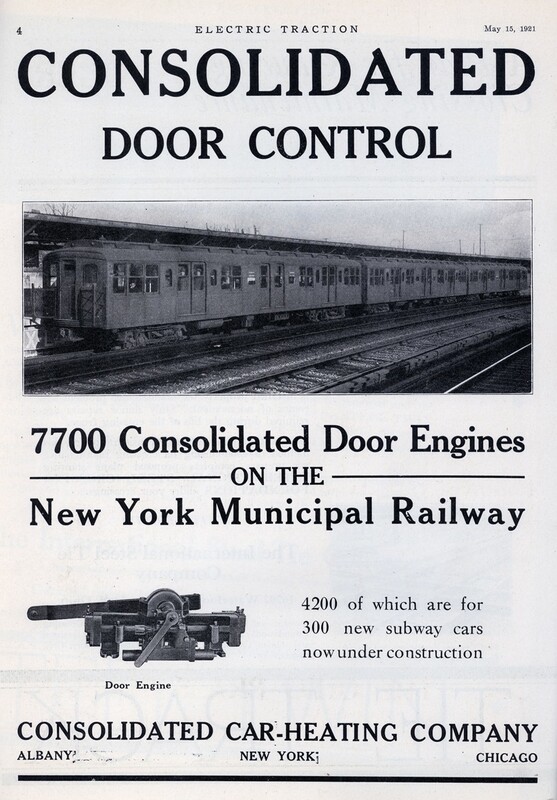 (The only other rolling stock in New York to have outside-hung doors were the Manhattan elevated cars converted to MUDC, or multiple-unit door control.) The home-grown design and conversion was fairly ugly. The C-types were finally retired in 1956 along with the last original portions of the Fulton El in Brooklyn. None survive. In the late 1930's, the BMT decided to modernize its fleet of elevated cars serving the Corona-Flushing Line for the 1939 World's Fair. They selected several of its old elevated cars for conversion into semi-permanently mated sets known as "Q" (for "Queens") cars. This involved enclosing the cars' platforms, installing quarter-point side doors, and reworking the control systems so that each set functioned in a motor/trailer/motor fashion. There were 30 three-car "Q" sets numbered 1600ABC through 1629ABC, and 12 two-car "QX" numbered 1630AB through 1641AB. The "Q" sets were arranged motor-trailer-motor; the "QX" sets had one motorized car and one unmotorized cab control car. In 1950, the "Q" fleet was transferred to the Third Avenue Elevated and lighter-weight trucks from IRT composite cars were fitted under the cars. The final change to the appearance of the "Q" fleet came in 1957, when they were transferred to the Myrtle Avenue Line and their railroad roofs were lowered in height so that they could make it through the subway to the Coney Island shop complex. They were finally retired at the cessation of Myrtle El service between Broadway and Jay Street in 1969. 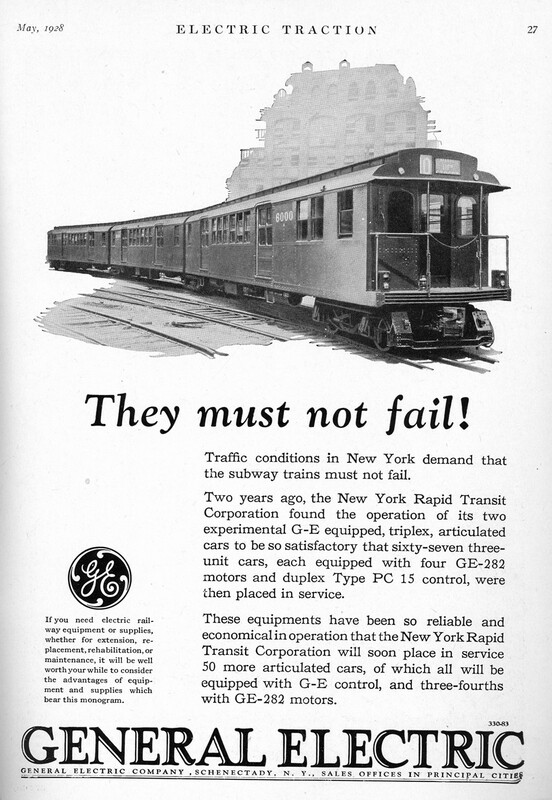 1921 rail industry advertisement featuring the BMT A/B Types. 1928 rail industry advertisement featuring the BMT D-Types. The BMT D-Type Triplex cars were ordered in 1924 under pressure from the city to abandon wooden cars in favor of steel, due to safety concerns arising from accidents, such as the Malbone Street wreck of 1918, which caused the financial demise of the BMT's predecessor the BRT. Unlike a standard subway car, which has a set of wheels, or truck, at each end, the triplex cars share trucks. The three car units are articulated and cannot be separated. A truck is under each of the articulated joints, and at each end. Therefore a triplex unit has four trucks, whereas a normal three-car train would have six trucks, two on each car. The trucks in the middle contain the motors, and the ones at the end are trailer trucks. The triplex was the heaviest car ever used in the New York City subway system. The first units, the pilots (6000-6003) went into service in 1925 (probably 9/1925). They were used on the Foruth Ave. Local. The production fleet started to arrive early in 1927 and the units were assigned mainly to the Fourth Ave. Local but also to the Brighton Local. In 9/1928, just before completion of delivery of the entire fleet, the units on the Fourth Ave. Local were moved to the Sea Beach Express and provided full service here, as well continuing partial service on the Brighton Local. On 4/27/1950, the units on the Brighton Local were moved to the Brighton Express, and on 5/27/1959 provided the mainstay of service here, continuing partial service on the Sea Beach Express. On 4/13/1963, the units on the Sea Beach Express began to be alternately used on the West End Express and the various Nassau St. services. Section A 55 Seats 45' 4.5"
Section B 50 Seats 38' 11.75"
Section C 55 Seats 45' 4.5"
1934 rail industry advertisement featuring the BMT "Green Hornet"
The BMT had a number of experimental trains that were ordered in small quantities, as few as one train's worth of cars. In addition, the BMT saw cars from the IRT and SIRT serving time on BMT lines. Five section articulated experimental train, built in 1934 by the Pullman Car Co. Built largely of aluminum and painted green, it became known as the "Green Hornet". It was delivered May 14, 1934, and entered service on the Fulton Street El August 29, 1934. It didn't last long, however; the Green Hornet was withdrawn from service on February 1, 1941 and removed from the 36 Street Yard by the scrap dealer Aug 30-Sep 1, 1943 because its aluminum was needed for the war effort. The Green Hornet was originally numbered 7000A-8000B-9000C-8001B-7001A. It was re-numbered 7003 A-B-C-B1-A1. Another experimental train, built of stainless steel by the Budd Co. became known as the "Zephyr". It was delivered June 28, 1934, and entered service on the Fulton Street El on August 13, 1934. Surviving longer than the Green Hornet, it was removed from service August 4, 1954 and scrapped in 1960. The Zephyr was originally numbered 7002A-8002B-9001C-8003B-7003A. It was renumbered 7029 A-B-C-B1-A1 in 1937. 25 five-car trains: units 7003,7014-7028 A-B-C-B1-A1 manufactured by Pullman; 7004-7013 A-B-C-B1-A1 by St. Louis Car in 1936. Six trains, blue & white paint scheme, car numbers 8000 A-B-A1 through 8005 A-B-A1, manufactured by Clark in 1938. 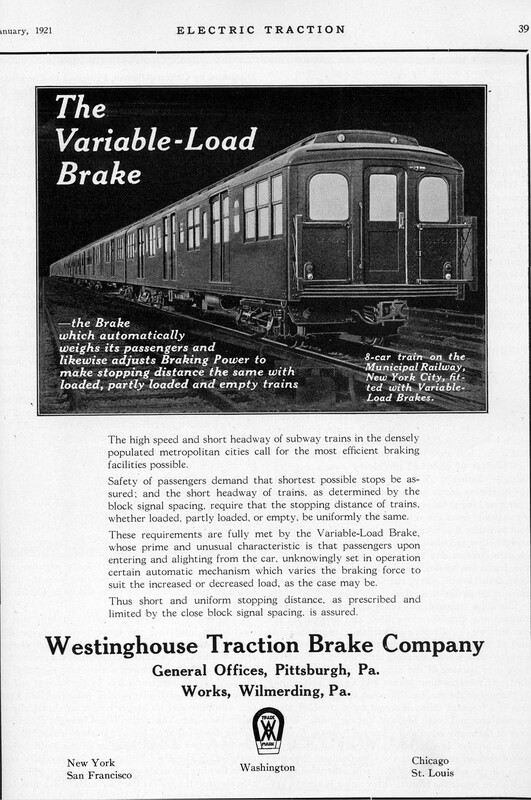 Orders for an experimmtal streamlined, light-weight, high-speed, three section car, built of aluminum alloy and equipped with rubber-cushioned wheels and rubber springs to materially reduce noise in operation on "L" and subway lines have been placed by the Now York Rapid Transit Corporation, it was announced today at the B.-M.T. offices, 385 Flatbush Avenue Extension, Brooklyn, N.Y. 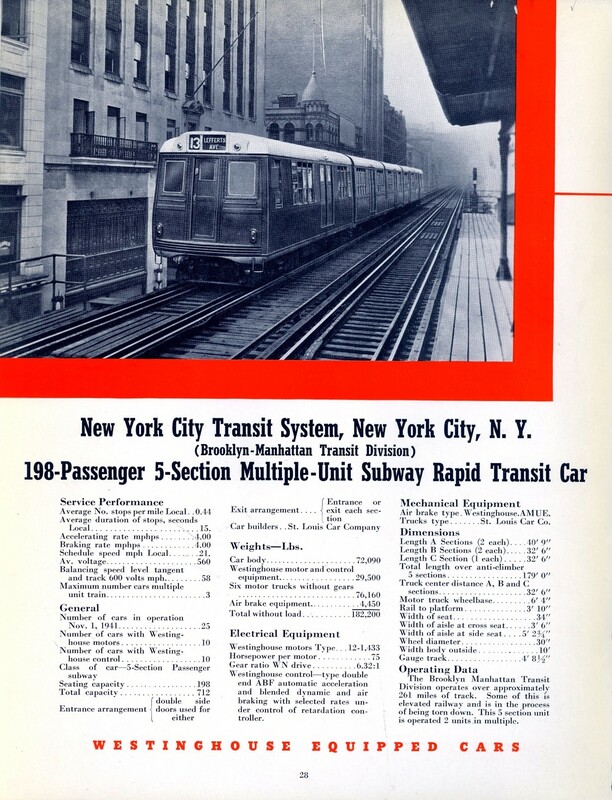 This new ultra-modern car is expected to provide an important and far-reaching an advance in the desiga and equipment of cars for "L" and subway operation as the Modern Street Cars am operated on the Smith-Coney Island, McDonald-Vanderbilt, Seventh Avenue, and Erie Basin street car lines in Brooklyn provided in the street railway field, The major purpose of the new type car is to adapt for rapid transit lines the results of the $1,000,000 research activities jointly financed by leading transit companies of the country that provided the scientific and engineering basis for the design and equipment of the Modern Street Car. 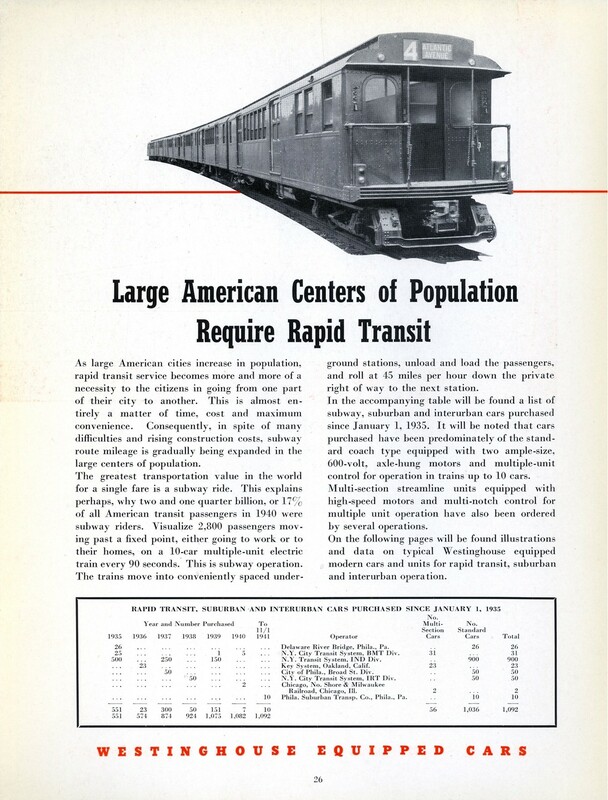 The car bodies and trucks of the new type rapid transit car will be constructed by the Clark Equipment Company, of Battle Creek, Michigan. The motor and control equipment will be furnished by the General Electric Company, the air brake apparatus by the Westinghouse Air Brake Company, and the door operating equipment by the Consolidated Car Heating Company. The car will be 80 feat 4 inches long and of the articulated type - with four trucks supporting the three sections of the car body, one truck at each end of the car and a truck under each of the two vestibules connecting the center and end sections of the car to permit passengers to pass from one section to the other. There will be seats for 84 passengers and the total passenger capacity of the car is estimated at 318 passengers. The trucks will have rubber springs to support the car body, similar to the rubber springs used with great success on the Modern Street Cars in Brooklyn, Chicago, Pittsburgh, Baltimore and other cities since their introduction in Brooklyn in October 1936. The trucks for the rapid transit car will include contact shoes to pick up power from the third rail and automatic stop devices for use in connection with the block signal system used on the rapid transit lines. The use of rubber springs not only helps to improve the riding qualities of the car but helps to reduce noise in operation by eliminating contacts between metal parts. The use of high tensile aluminum alloys in the body structure makes possible a substantial reduction in weight as compared with standard type subway cars. The estimated maximum weight per axle of the new car with full passenger load is 14,400 pounds, as compared with 35,000 pounds for a standard subway car. The estimated weight per linear foot of the new car with passengers is 1,430 pounds as compared with 2,014 pounds for a standard subway car. The estimated cost per linear foot of the new car in quantity production is aprroximetely $500 as compared with approximately $720 per linear foot for cars for the Independent Subway. For motive power there will be eight motors of 55 h.p. each - one motor on each axle. The control apparatus has been designed to provide rapid but smooth starts (acceleration) and stops (deceleration) by automatically graduating the increase or decrease of power to the motors. This permits faster schedules of operation for this car in comparison with standard subway cars. An important feature of the new cars is the use of three braking systems - a dynamic braking system in which the motors are used to stop as well as start the car; magnetic track brakes which operate directly on the rails and are located between each pair of wheels; and the air brakes with brake shoes on the wheels. By reducing to a minimum the use of brake shoes in stopping trains, much of the brake shoe and steel dust created by the friction of the brake shoes on the steel wheels will be eliminated and in the subways particularly the new type cars will provide a cleaner and healthier as well as practically noiseless operation. The use of resilient wheels - wheels in which the axles and steel rims or tires are cushioned by rubber pads or "sandwiches" vulcanized to steel plates so the car literally rides or floats on rubber - is also an innovation in rapid transit car design. This type of wheel, however, has stood severe tests in operation on the Modern Street Cars since October 1936. Many of the precision equipment units developed in recent years are to be used in the new car - notably hypoid geers, shock absorbers and roller bearings all of which are designed to reduce or eliminate noise in operation. Mechanical ventilation will be provided - air forced by blowers through ducts to various parts of the car so as to maintain constant circulation of air, with an air filter to eliminate dust from air taken into the ventilation systam from outside the car. For illumination, the car will be equipped with non-glare, high intensity lights, arranged to provide an even distribution of light throughout the car. Car numbers 2900-2924 purchased from SIRT. These cars were similar to but incompatible with the BMT Standards. Some cars later used for work service, yard offices. Car numbers 4581, 4583, 4584, 4585-4605 converted with wide sills at platform level for use on BMT lines, 1959-1961. C-Type Wikipedia Article, more specfications about the C-type fleet. Q-Type Wikipedia Article, more specfications about the Q-type fleet. The New York Municipal Car (BMT Standards) (1915-1921), several reports from the Electric Railway Journal between 1915 and 1921 describing the technical specifications of the BMT Standards. There are 2761 photos available. 33, 1076 Fire damage, 12/07/1922. 80, 100, 725, 726, 1064 Damaged or destroyed in the Malbone Street Wreck, 11/1/1918. 82 Damaged and rebuilt into Car 684, circa 1910. 197 At Shore Line Trolley Museum. 659 At Shore Line Trolley Museum. 732 Wrecked, no other info available. 913, 919 Fell from elevated structure at Flatbush and 5th Avenues, 6/25/1923. 999 Elevated Instruction Car. At Shore Line Trolley Museum. 1080 Collision at Ocean Parkway, 8/5/1924. 1227 At Shore Line Trolley Museum. Operational. 1349 At Shore Line Trolley Museum. Operational. 1362 At Shore Line Trolley Museum. 1365 At St. Louis Museum of Transportation. 1404, 1407, 1273 At New York Transit Museum. Since 1979, cars 1404, 1273, and 1407 have been on display at NYTM and has occasionally run in fantrip service. These three cars, a motor/trailer/motor set of Brooklyn elevated "gate" cars, have led a strange and eventful life. For the first three decades of their life they operated in essentially the configuration they are currently in: open-plaform wooden cars. These three cars were selected in 1938 to be part of the "Q-type" modernization program. Car 1404 became the "C" car of set 1603; car 1407 became the "A" car of set 1603; car 1273 became the center trailer car 1603B. In 1957 the 1603ABC set was renumbered to 1622ABC. Retired in the late 1960's along with the other "Q" types, the set now numbered 1622ABC was chosen for preservation and operated on fantrips during the 1970's. In 1979 it was decided that the three cars in set 1622 would be rebuilt to original as-built condition. This was done, but incompletely; the cars retained their 1957 lowered roofs and 1950 lightweight trucks. --Frank Hicks and Jeff Hakner. 1602A At Trolley Museum of New York. 1609C Involved in collision with SIRT 2925 at Fresh Pond Yard, 1/14/1966. 1609C suffered minor damage, while the SIRT car was pushed on to the tracks of the LIRR Montauk Branch. 1612C At New York Transit Museum. The best-preserved example of a BMT "Q" type rapid transit car is 1612C, preserved in the only rail museum in the country actually situated in a disused subway station, the New York Transit Museum. This car was built as a single-unit, open-platform wooden elevated car for service on the BRT, and for the first three decades of its life it operated as such. This car was selected in 1938 to be part of the "Q-type" modernization program. Retired in the late 1960's along with the other "Q" types, 1612C was first converted to alcohol sprayer car 30504 (20504), and then chosen for preservation sans the other two cars in its set. In the late 1970's, when preserved "Q" set 1622ABC was rebuilt to open platform configuration, 1612C was restored to its c1940 condition and placed in the NYTM where it has remained on display for over a quarter century. --Jeff Hakner and Frank Hicks. 1630X, 1631X, 1612B, 1631X Converted to reach car service, 30617, 30618, 30619, and alcohol sprayer car 30505, respectively. 2204 At New York Transit Museum. Not operational. 2330 Hit bumper block at Broad Street, 2/25/1953. 2390, 2391, 2392 At Coney Island Yard. Owned by Railway Preservation Corp. Out of service for many years but was restored 2010-2015 and ran in Transit Museum excursion service June 26, 2015. 2500, 2714, 2741 Converted to revenue collector cars 30178 (20178), 30179 (20179), and 30180 (20180) respectively. 2631, 2866-67-68 and 2768-69-70 Collision at Sea Beach line portals on 11/21/1959. Scrapped 12/12/1960. 2761 In collision with R-27 8217 at Coney Island. 2775 At Shore Line Trolley Museum. Non-operational (was involved in a flood at museum site). 6019ABC, 6095ABC, 6112ABC New York Transit Museum collection. Once the museum's regular Nostalgia Train, the D-Type museum fleet has been laid up since 2004 due to various mechanical issues. One set is kept in the museum and the other two at Coney Island Yard. During 2015 the Triplexes were restored to operation and operated in Transit Museum excursion service on June 26, 2015. During the 2015 shop work, they were made compatible with the IND "R-1/R-9" museum fleet for possible joint service. 6078ABC-6045ABC Collision at Stillwell Avenue, 6/19/1955. Rebuilt as 6045AB-6078C and renumbered 6045ABC.